Tissot, James (1836-1902). French painter and graphic artist. Early in his career he painted historical costume pieces, but in about 1864 he turned with great success to scenes of contemporary life, usually involving fashionable women. Following his alleged involvement in the turbulent events of the Paris Commune (1871) he took refuge in London, where he lived from 1871 to 1882. He was just as successful there as he had been in Paris and lived in some style in St John's Wood; in 1874 Edmond de Goncourt wrote sarcastically that he had `a studio with a waiting room where, at all times, there is iced champagne at the disposal of visitors, and around the studio, a garden where, all day long, one can see a footman in silk stockings brushing and shining the shrubbery leaves'. His pictures are distinguished most obviously by his love of painting women's costumes: indeed, his work--which has a fashion-plate elegance and a chocolate-box charm-- has probably been more often reproduced in works on the history of costume than on the history of painting. He also, however, had a gift for wittily observing nuances of social behavior. 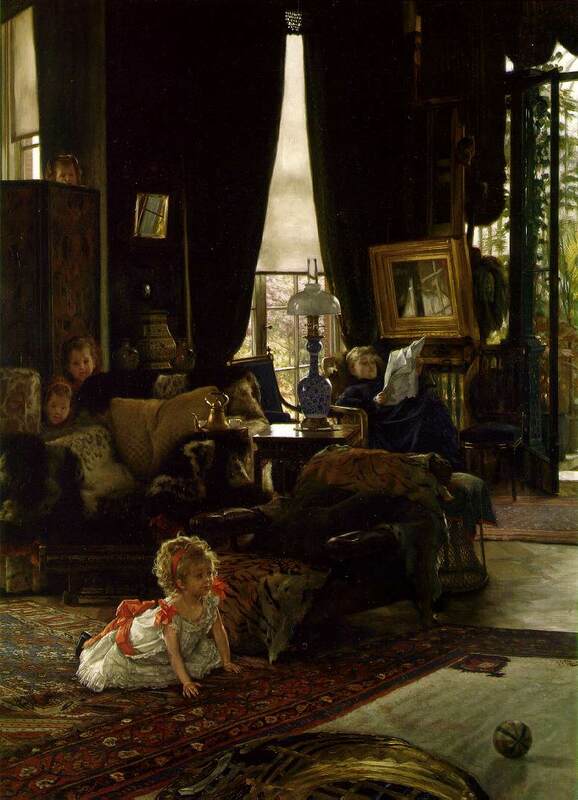 In 1882, following the death of his mistress Kathleen Newton (the archetypal Tissot model-- beautiful but rather vacant), he returned to France. In 1888 he underwent a religious conversion when he went into a church to `catch the atmosphere for a picture', and thereafter he devoted himself to religious subjects. He visited the Holy Land in 1886-87 and in 1889, and his illustrations to the events of the Bible were enormously popular, both in book form and when the original drawings were exhibited.